The topic of interventional radiology radiation exposure and potential future cancer risk raises many different questions among health professionals, families and the community. The Radiation Protection of patients website of the IAEA has wealth of information for children and adults. The American College of Radiology has recently published a broader overview of the issues of radiation dose in medicine. Find the White paper here. Facilities that are knowledgeable on pediatric imaging have been shown to use lower radiation dose techniques than most general facilities. A guide to pediatric interventional radiology services near you can be found on the Society for Pediatric Interventional Radiology website www.spirweb.org. The National Cancer Institute provides general information about interventional fluoroscopy. Future pediatric specific updates are being planned. Find the information here http://www.cancer.gov/cancertopics/interventionalfluoroscopy/page1. The United States Food and Drug Administration has published recommendations for reducing radiation risk. Find it here. Medical sources of radiation to the population have increased over the last 20-30 years. This is of particular concern in children whose tissues are more radiosensitive, whose organs receive a larger effective dose for a given level of radiation, and who have increased lifetime to develop cancers as a result of radiation exposure. It is difficult to demonstrate that radiation doses from medical imaging lead directly to cancer or to state with certainty the exact risk of cancer related to medical radiation; however the committee on the Biological Effects of Ionizing Radiation (BEIR) VII states “… the risk of cancer proceeds in a linear fashion at lower doses without a threshold and … the smallest dose has the potential to cause a small increase in risk to humans.” While for any one individual the potentially increased risk is very small, the risk to the population as a whole is larger. The risk is potentially cumulative with repeated radiation exposure. Therefore all studies that expose a child to ionizing radiation should be carefully evaluated as to the potential risk versus the likely benefit. Fluoroscopic studies entail radiation exposure to not only the patient but also (to a much lesser extent) the fluroscopist and other assisting .personnel. This is especially true in children in whom several persons may be required to help position and occasionally immobilize the child . The amount of radiation resulting from fluoroscopic procedures is highly variable, dependent upon fluoroscopic parameters which in turn depend upon several factors, including patient size and desired image detail, as well as study indication. The type of procedure performed has a great impact upon patient dose, with those procedures which require long fluoroscopy times, such as interventional procedures, providing the largest doses. Effective radiation dose for a VCUG has been reported as approximately .5 to 3.2 mSv and an upper gastrointestinal series as 1.2 - 6.5mSv. as compared to an approximate dose of an abdominal CT in a child of approximately 6mSv. Do children undergo many fluoroscopic studies? The advancement of endoscopy CT and MR techniques has resulted in a decline in fluoroscopic procedures; nonetheless fluoroscopy remains an important and frequently used procedure in the pediatric patient, particularly in the US. In a survey of pediatric radiologists conducted by SCORCH (Society of Chairmen of Radiology in Children’s Hospitals) in 2007 the mean number of annual fluoroscopies reported per surveyed hospital was 4,296. Approximately 35% of pediatric fluoroscopic studies are voiding cystourethrograms (VCUG), 30% upper gastrointestinal studies( UGI), and 7% contrast enemas, with miscellaneous categories comprising the remainder. In addition to Diagnostic Imaging, there are several other sources of fluoroscopic radiation, including fluoroscopy for orthopedic procedures, fluoroscopy in the OR for central line placements and other procedures, and fluoroscopy by other services, such as Gastroenterology and Cardiology. Can the risk from fluoroscopic studies be lessened while still obtaining diagnostic studies? Having a clear understanding of the patient’s problems and goals of the study is important; providing a detailed relevant history to the radiologist is very important to achieve this goal. It is also very important to limit fluoroscopic time in general and use of magnification mode in particular; careful collimation to the area of interest and appropriate shielding, bringing the patient as close as possible to the image intensifier, matching tube output (kVp and mAs) to the size of the child, utilizing grid- controlled pulsed digital fluoroscopic equipment with adjustable frame speeds and half dose key as well as last image hold and capture capability are also important measures to optimize the examination. Should I not request fluoroscopic studies in my pediatric patients? Fluoroscopic studies are often very useful and can provide valuable and even lifesaving medical information. As with any test, there should be clear reasons to order the study. In some situations ultrasound or occasionally magnetic resonance imaging could provide similar information without exposing a child to radiation. The American College of Radiology (ACR) publishes appropriateness criteria for pediatric conditions that discuss the utility of various imaging strategies. Discussing the clinical situation and medical information with the pediatric radiologists providing your imaging services can help determine whether an alternative test might be better. If a fluoroscopic study is needed, ensure that your imaging facility uses appropriate fluoroscopic equipment, protocols and techniques for children, and that those performing and interpreting these pediatric studies are qualified and experienced. How can I determine if my imaging providers are using appropriate fluoroscopic imaging techniques? Without asking, you won’t know. Some facilities may not have fluoroscopic equipment suitable for children or experienced personnel who frequently perform pediatric procedures and may not adequately adjust dose techniques for children or limit the fluoroscopic time and number of spot films or overhead X-rays that are typically obtained in adults. Should I talk to parents about the radiation risk of a fluoroscopic study? The diagnostic benefit that the study can provide in the short-term almost always outweighs the long-term risks. While it seems that informing parents might deter them from acquiescing with potentially important studies, recent research regarding CT found that parents who were told about the risks and benefits still agreed to have the study performed ( Larson DB, et al. 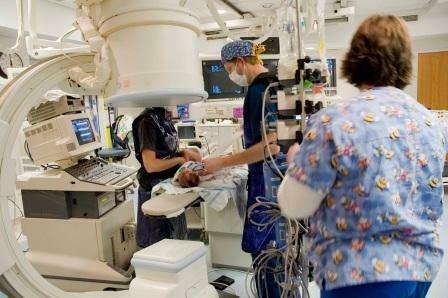 Informing parents about CT radiation exposure in children: it’s OK to tell them. AJR 2007;189:271-275). You should not hesitate to discuss the use of radiation with patients and families. Where can I find guidelines/protocols for pediatric fluoroscopic studies? Return to the “What can I do?” section of this website for specific guidelines and suggestions for every member of the imaging team including specific recommendations.